A healthy winter tea for prevention of colds and to be enjoyed as a general tonic. Equal amounts of catnip, comfrey, and red clover with half the amount of sage. 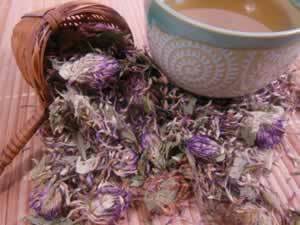 M. Grieve writes "An infusion of red clover may with advantage be used in cases of bronchial and whooping-cough"
Flu : Flu, or influenza is not just a severe cold, the flu is caused by a virus. The flu is very contagious, and preventative measures should include antiseptic and antiviral herbs.